Istanbul is a “global city” building upon neoliberal policies that prioritize marketing strategies for cities. The last decade witnessed a competitive strategy of urban transformation leading to the rhetoric of “mega city” or “financial capital” for Istanbul. This strategy was further highlighted by the renewal projects for the historic inner city. Urban renewal projects attracted interest from investors and residents leading to loss of certain cultural and historic heritage assets. The “Global city” project stems from the reproduction of the city in the framework of an accumulation process and its mechanisms of neoliberal production and consumption patterns. This project consists of spatial, economic and political processes. Cihangir is on the European side of Istanbul with a view of the Bosphorous. The neighborhood is east of Istiklal Street, which is a main attraction point located within the touristic centre of Beyoglu at the heart of Istanbul. Traditionally, Cihangir accommodated a major non-Muslim and well-off population like consulates and international institutions located in Beyoglu. At the beginning of the 20th century, multi-storey masonry apartment buildings started to appear and this turned Cihangir into a dense residential neighborhood. The area became dilapidated in areas where low-income and marginal groups moved, partly due to its closeness to the deteriorating city centre at the time. The gentrification period of the district began in the 1990s, parallel to transformation activities in Beyoğlu. Following the pedestranization of Istiklal Street, and rehabilitation of the Tarlabaşı neighborhood which is to the west of Istiklal Street, Cihangir gained more importance. Artists and intellectuals began to show an interest due to the neighborhood’s closeness to cultural and tourism activities and to related faculties of universities. The historic fabric of housing may have played a role in this process, and the gentrification of Cihangir led to renovation of the fabric. In the 1990s, the socio-economic structure changed rapidly as its popularity grew. Newcomers were middle class, while low-income groups, students and marginals who had taken refuge in Cihangir were dislocated by this development. The Cihangir Neighborhood Association was established in 1995 as a result of residents’ awareness for the conservation of authentic characteristics of Cihangir. Most of the members of the Association were architects and professionals. Their aim was to protect the uniqueness of the housing stock as well as to upgrade the quality of the urban environment. Through this foundation, the renovation activities were carried out collaboratively. The profile of the population living in the neighborhood further changed during the renovation processes of Cihangir. Gentrification proceeded at a rapid rate and caused a sharp increase in housing prices and rents. The process was also fueled by the “Beautiful Beyoglu” project launched by the Beyoglu Municipality, which attracted investors and entrepreneurs to the district. In the 1990s, artists and intellectuals started to show a special interest in Cihangir due to the central location of the neighborhood and its historic buildings. Cihangir became popular among academics as well since a number of universities specializing in fine arts and architecture were located in the vicinity. Cihangir became more popular in the 1990s. Its population started to change rapidly with the area being invaded by residents of a higher socio-economic and cultural status (Islam, 2005). According to 1999 survey results, the average household size and the average number of children per household were found to be close to the urban averages. Most households consisted of nuclear families. Most household heads and their spouses were born in Istanbul or in other urban centres of Turkey and had moved to Cihangir or had been living in Istanbul for several generations. The ratio of university graduates in Cihangir rose to 45.2% (Uzun 2001). In Cihangir with the factors of diversity, tolerance, and personal network and meeting places, three new social groups come to the forefront. Observed new social groups of Cihangir are old residents, new residents, and temporary residents, in terms of the duration of residency in the neighborhood. First of all, old residents comprise rural migrants from Anatolia and Eastern Turkey, small numbers of non-Muslim minorities, old Istanbulites and local Cihangirlis (people living in Cihangir), and also early gentrifiers who are mainly academics and artists that came to the neighborhood during the 1990s. This old resident group is used to ethnic and cultural diversity, and living in a traditionally diverse neighborhood from the beginning, because both pre-gentrification residents and early gentrifiers have witnessed a socially diverse composition (Demirel, 2015). Therefore it can be stated once more that new residents look for cultural capital or economic capital. In terms of diversity, new residents are familiar with gentrification and old residents in the neighborhood. Even though during the interviews some displayed no tension, generally they are not tolerant of the arrival of new heterogeneous socio-demographic groups in their neighborhood. In a sense, they have attempt to find areas of “people like us”. Cihangir relatedly starts to become an emancipatory place for the middle class. In terms of networking, they mostly prefer the newly established cafés and stores. They all have their distinctive meeting places and cafés in the neighborhood (Demirel, 2015). Demirel, S. 2015. Reconceptualizing the gentrification process: The case of Cihangir, Istanbul. Unpublished Master Thesis. Middle East Technical University. Islam, T. 2005. Outside the Core: Gentrification in Istanbul in R. Atkinson and G. Bridge (Eds. ), Gentrification in a Global Perspective, London: Routledge. Uzun, N.C. 2001. Gentrification in Istanbul: A diagnostic study. Utrecht: KNAG. See an intresting story from Vienna? During the early 1990s, first marks of gentrification have emerged in Cihangir and the neighborhood has changed greatly over the past 20 years. Cihangir has been a traditionally and socially diverse community in all times and welcomed many different ethnic groups and nationalities. It has always been an important part of the cosmopolitan Istanbul. 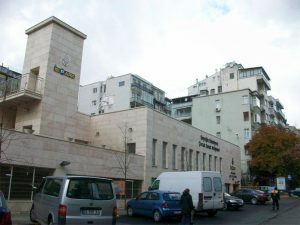 At the beginning, Cihangir accommodated densely foreign nationalities working in the embassies, consulates, schools, and banks in Beyoglu (Pera). Today this multi-ethnic and multi-cultural presence of the neighborhood still exists. Being home to diverse groups, Cihangir is one of Istanbul's most attractive neighborhoods. Cihangir has been a traditionally and socially diverse community in all times and welcomed many different ethnic groups and nationalities. It has always been an important part of the cosmopolitan Istanbul. At the beginning, Cihangir accommodated densely foreign nationalities working in the embassies, consulates, schools, and banks in Beyoglu (Pera) and non-Muslim citizens especially Greek citizens. Today this multi-ethnic and multi-cultural presence of the neighborhood still exists. Being home to diverse groups of writers, artists and intellectuals, university students and exchange students, Cihangir is one of Istanbul’s most attractive neighborhoods. Besides all its physical advantages, the neighborhood offers a diverse socio-demographic ground. Currently it has a cozy and relatively independent environment and the neighborhood not only accommodates its residents but also hosts many visitors daily as there are various commercial and entertainment venues. Old (long-term) residents have an emotional commitment to their neighborhood. Residents mostly mention about the old composition and neighborhood’s “good old days” with nostalgia by referring to the old neighborhood culture and the neighborly relations between non-Muslims and Muslims. While some of them think that the neighborly relations are still strong; others complain about the new composition. However almost none of them are willing to move from Cihangir. There are also relatively new residents. They mostly want people like themselves to come to Cihangir but they do not take a stand against old residents either (Demirel, 2015). All in all, diversity in Cihangir rises from the overlapping socio-economic and political processes which are non-Muslims departure, arrival of rural migrants, emergence of gentrification, and currently new comers related to new mutations of gentrification. Today there are many diverse groups in the neighborhood (Demirel, 2015). Show us your Cihangir: Include #Cihangir and be part of the community. The effects of capital accumulation processes are manifold with regard to gentrification. Cities of the world with variable economical, political and social characteristics face the burden of globalized processes. Contingent forms of gentrification are interlinked with various forms of capitalist restructuring systems. The economic changes experienced in Cihangir as a result of gentrification are probably those changes that had the most characteristics in common with the other neighborhoods studied in the project. Rising prices of highly specialized consumption goods are the main parameters of change regardless of the diversity in socio-economic aspects prevailing in the forms and processes of gentrification. Middle classes that relocate in gentrified areas assert their tastes in more specialized consumption goods and in Cihagir these economic characteristics of gentrification are manifested. Some of the local entrepreneurs are old residents of Cihangir and they carry on their traditional economic practices even though they try to keep up with the demands of changing times. In addition, the number of specialized and boutique cafes and restaurants has been on the rise. These establishments do not exhibit signs of uniformity; and they are initiated by independent, individual entrepreneurs. The gentrification process in Cihangir proceeded in the market developments. Individual residents had been the actors in the gentrification process responding to the locational attraction of the area. The process accelerated when investors acted on the demand that followed the pioneering artists’ location selection in the neighborhood. Gentrification started in the early 1990s in Cihangir. The neighborhood’s attractiveness initially stemmed from the locational advantages of Cihangir. Being close to the Beyoglu district, where major cultural activities take place, has been one of the attraction points for Cihangir. Moreover, proximity to the Fine Arts Faculties of some universities has also been an important factor for the attractiveness of the neighborhood. Increases in property prices and rising rents resulted from the housing demand of middle and high income groups and professionals in the neighborhood. This, in turn, caused new processes of gentrification for low income residents and marginal groups living in Cihangir. The area had been designated as a conservation area in the mid 1990s. Conscientious residents of Cihangir established the Cihangir Neighborhood Association in 1995 in the quest to conserve the historical and environmental assets in the neighborhood. Politicizing of gentrification has its own specific character in Cihangir. Its practices cannot be considered as being complicit to the neoliberal state. In this sense politicizing of gentrification practices cannot be straightforwardly considered as a right of the neighborhood either. In the 1990s Cihangir gentrified almost completely, displacing low income residents and other marginal groups from the neighborhood. This never became a political issue then. However, today things have changed and Cihangir, together with many other neighborhoods in the area is under threat of gentrification. Large-scale commercial redevelopment oriented tourism industry played an important role in the process. Neighborhood associations have challenged plans supporting this process, and they have been fairly successful. Thus there are certain conditions in place in Cihangir and its vicinity in Beyoglu. Some of these are conditions of an oppositional nature, but many are not. Gentrification in Cihangir comes down to middle class liberals defending their ground against a neoconservative state, mainly for cultural reasons. They in fact oppose the sanitized commercial and tourist spaces in Beyoglu along with their ramifications for Cihangir. Cihangir Park has witnessed a dramatic change throughout time. 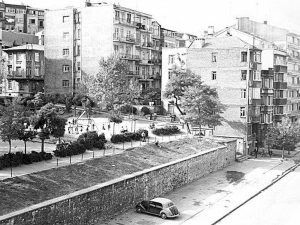 The Cihangir Park was planned to be a green area and a playground after its parcel was donated by a resident of the neighborhood, Nuri Demirag, in 1938. The park has served to its purpose until 1983. In 1983 a garage was constructed underneath the park. This first intervention carried out in this park caused damage to the trees and many were cut. The second major intervention was in 1995, which led to the establishment of the Cihangir Neighborhood Association. The members of the Association approached the Beyoglu Municipality for a park renewal project. The project found support by the municipality. Architects and landscape architects who designed the park were among the residents of Cihangir. Fund raising events included street parties for the Park. The opening ceremony was a big event joined by the municipality officials, members of the associations and residents of Cihangir. The third intervention was in 2010, when the municipality transferred the operation rights of the garage to shareholding sub-organization. The park was re-paved. This new construction was not supported by the residents of Cihangir. They complained about the noise and dust and showed their reactions through protests.